At Large In Ballard: Purrfecto! Cynthia Chomos and Serena in the latest addition. Photo courtesy of Catio Spaces. Cynthia Chomos is a Feng Shui and color consultant. She specializes in designing spaces. It just happens that most of her is designing outdoor spaces for cats, and with the onset of summer this is her busy season. 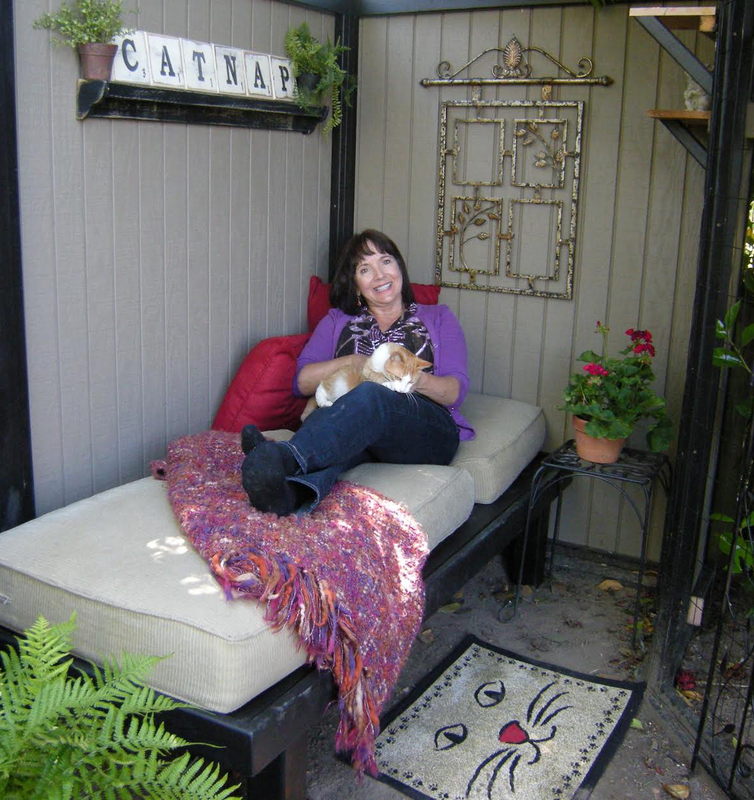 When I told someone I was doing an interview about cat patios, or catios, she was surprised to learn they are “a thing.” The more you learn about them the more sense it makes. Especially if you want to be approved to adopt a cat by many shelters, and then want to increase the chance of the feline’s survival. As Chomos says, “A cat’s primal urge is to be outdoors.” Hence her company, Catio Spaces, which creates “safe outdoor enclosures” to give the “indoor” cat access to the outdoors, but without the ability to kill birds or dig in the neighbor’s lettuce starts. Caging animals has been a very human desire ever since we made the dubious distinction between us, and them. Since we couldn’t outrun the lion…we created zoos. Then we domesticated cats and dogs. But in Ballard we live in a city with leash laws and coyotes, car traffic and backyard wildlife sanctuaries. And cats that want to do what cats do, which is kill birds, roam at night and use the garden bed instead of their clumping kitty litter. An enclosed cat patio suddenly makes absolute sense. Although Chomos has long incorporated design and nature in her consulting work it was only a few years ago that she added the third element, cats. Raised in Edmonds Chomos has lived in her Ballard house since 1986; she can’t imagine living anywhere other than Ballard. Over a decade ago a cat adopted her, slowly moving in with Cynthia when the owners acquired a dog. Despite kidney problems the cat lived until age 22. After that loss Chomos didn’t know when or if she would want another cat. Then she dreamed about a female orange tabby with a certain white pattern and had to find the cat that had come to her in a dream. She found Serena, or perhaps Serena found her. Still mindful of the loss of her 22 year-old and committed to the new cat’s longterm health she began designing outdoor spaces with 24-hour access. The window box space in the sunniest spot in the front yard later prompted the backyard access and now the cat gateway that runs from the back of house to a stand-alone studio in the southeast corner of the yard. The gateway runs along the upper edge of the fence, high above the ground. Chomos didn’t invent catios, or the term. Portland, Oregon has had a catio tour for many years now. However Chomos has emerged as an industry leader in catio design, Chomos gets 3-4 out-of-state queries per day. Animal welfare organizations, locally and nationally, are major proponents of these safe, enclosed spaces. On Saturday, May 21, 2016 a Catio Tour will show off the local structures. PAWS and The Humane Society of the United States are co-sponsors, along with Catio Spaces, of Seattle’s 2nd Catio Tour. The Catio Tour will feature eleven locations throughout the city; five of them designed and built by Chomos and her crew. Chomos meets with the clients, human and feline, in order to learn about their habits and behavior. After several years of cat-consulting she classifies the following indoor types: door dashers, bird bandits, screen slashers, sun worshippers, alley cat fighters and coyote victims. Her products range from Do-It-Yourself Kits (starting at $49) through elaborate backyard creations, such as those with water features, themes and spiral staircases. The outdoor spaces can aslo include plantings, and even accouterments for visiting humans. For some clients it is a truly an outdoor room. Chomos uses a galvanized mesh, although she modifies the mesh size depending on the environment. For Redmond clients she has to keep in mind the risk of bears and bobcats. Most of her supplies come from Limback Lumber and Stoneway Hardware. Animal organizations, cat owners, and probably neighbors of cat owners, all support outdoor enclosures in the interest of keeping cats, local birds and wildlife able to share space and be safer. We see the Lost Cat signs and feel for the owners, the birds “lost” to cats don’t get their own signage. Registration for the May 21, 2016 event is at CatioTourSeattle.com. A suggested donation of $10/person goes directly to PAWS. Information and directions to each site is sent once registered. The neighborhoods include Ballard (multiple), Wallingford, Roosevelt, Kenmore, Wedgwood, North College Park and West Seattle. Catio Spaces is 90% of Chomos’ work these days. “Neighborhood cats give it paws up,” she says. Meanwhile Serena happily travels along her cat gateway, exiting and entering the house as she pleases. A visiting gray cat looks jealous, strangely on the outside looking in to the latest cat domain. Serena, by the way, is a sun worshipper. For the already indoor cat the addition of a Catio would probably be the realization of their return to nature dreams, except the bird will always get away. For cats already used to the freedom of the outdoors, oblivious to its dangers from anti-freeze, cars and coyotes, it would be an adjustment. As a cat owner I’m calculating the costs and can see that the savings on veterinary bills could offset those of enclosure materials. And for anyone who thinks cat owners spoil their pets, remember, it wasn’t a cat that caused a power outage for 38,000 customers last week. www.CatioTourSeattle.com. Saturday, May 21st, 12-4 p.m. Free but with suggested donation.